When it comes to Spring, this is my ideal outfit! I love to wear floral prints, fun colors, and light layers. With this outfit I really like the combination of my mint green top, royal blue bag, and colorful scarf (last seen here) for a fun weekend look. 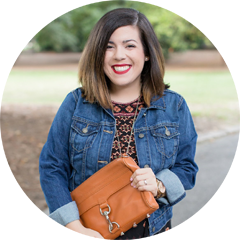 It’s perfect for going out to brunch, and if I switch out my jeans for black pants it’s a perfect work outfit too! This outfit will definitely be on my rotation. What’s your favorite Spring outfit? 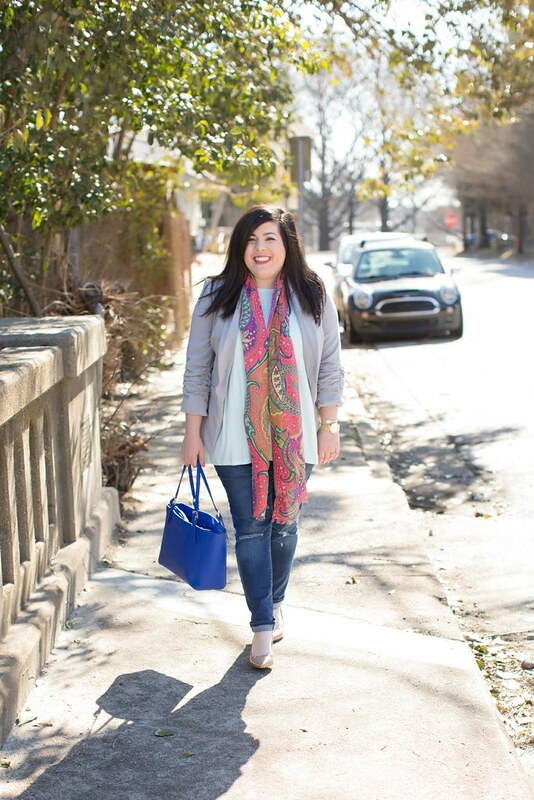 I love this light jacket and the scarf is the perfect touch. That scarf is so gorgeous! 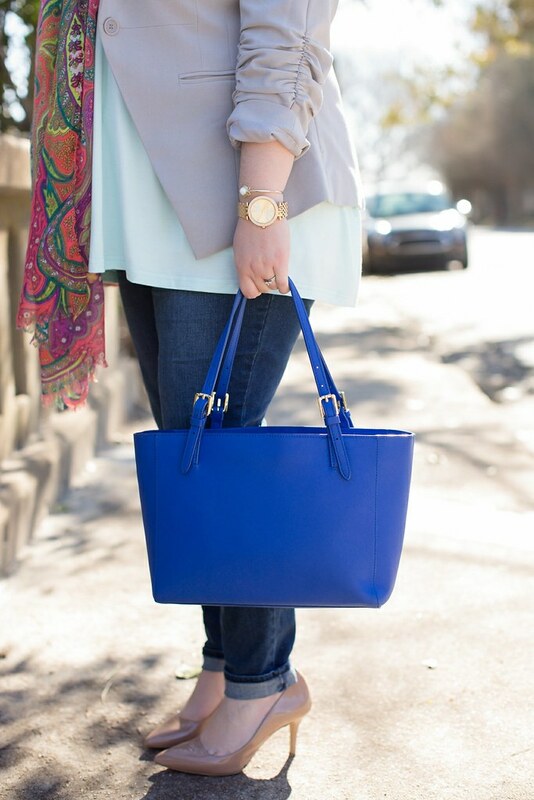 I love it with the bright blue bag too! This is SO Springlike and gorgeous on you, I am jealous of that sunshine! I absolutely adore this looks! So spring! Lovely Spring ensemble plus killer smile – love it all!!! Love this look!! Great purse! 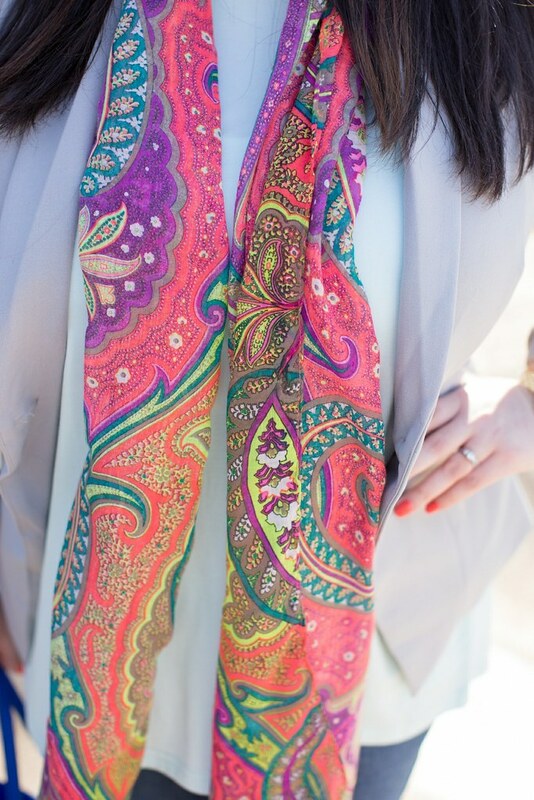 Loveeee this scarf, the colors are so pretty!! That scarf is gorgeous! Your spring wardrobe is killing it! You look so pretty, I love this! Definitely my ideal outfit too! I wear a version of this to work today: coral blazer, loose top, jeans, and flats! You look so cute! Such a perfect spring look! Love love that scarf! 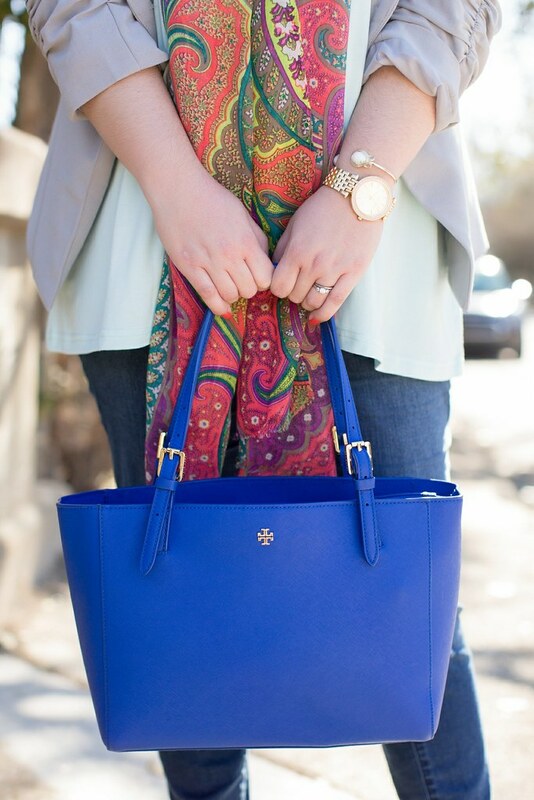 I love how you tied your beautiful bag and the blues in your scarf together! A great take on spring patterns! 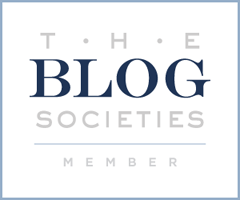 Thanks for being a part of the blogger collective meetup! Love how you paired such polished pieces with your distressed denim. Great look! 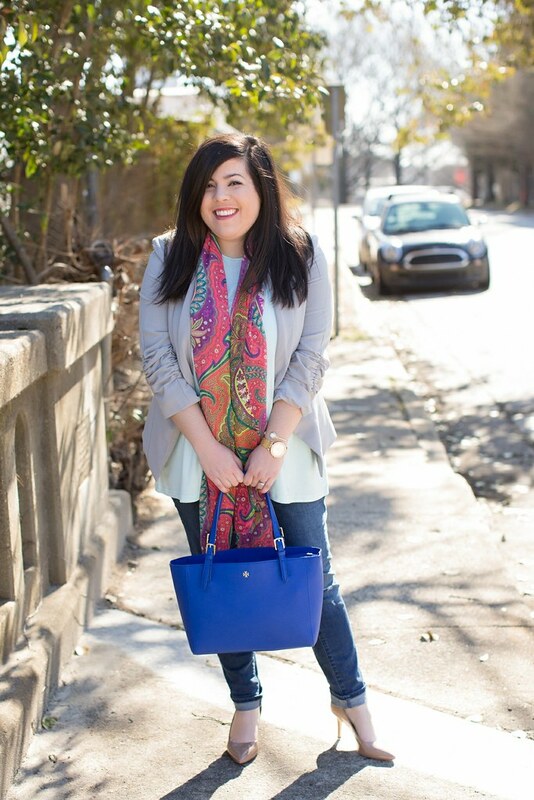 Absolutely love the paisley and that blue bag is perfect! I love your bag! I love Tory Burch, and I've been eyeing this tote bag for weeks! Love your style girl! 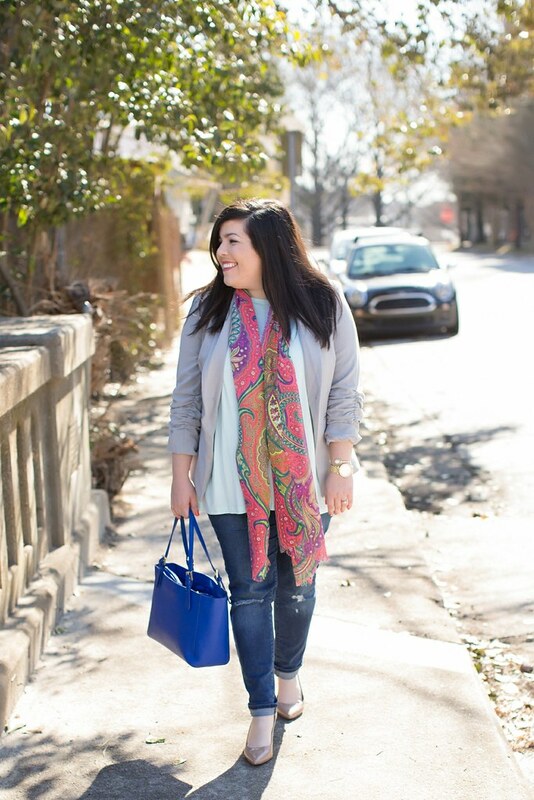 I love the color that the scarf brings to your outfit. I feel like my mom when I wear scarves, but I think I finally get why she wears them all the time. They're almost the perfect accessory. Second only to an amazing pair of shoes. Love your bright blue bag & patterned scarf, they really change the look of a classic blazer and jeans 🙂 it's all about the accessories! Gorgeous look for spring! 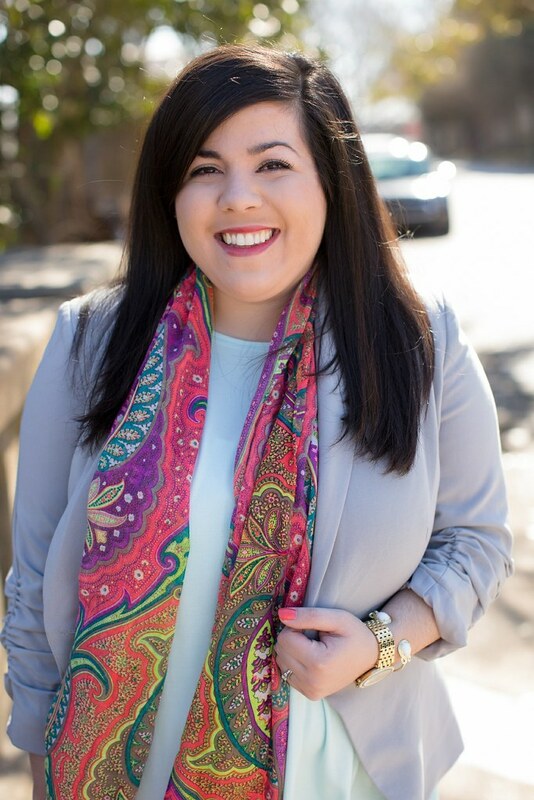 🙂 I love the floral scarf with this blazer! You look beautiful! This outfit is stunning. I love the colours you added against the neutral blazer! The scarf and bag are amazing.